IRCA is a deeply controversial piece of legislation. It seeks to change human migration patterns and to re-allocate money (taking it from illegal alien workers and their employers and transferring it to others, primarily legal resident workers). The focus here is narrow; it is to examine the few quantitative results which are visible as IRCA comes up to the one-year mark. to reduce the impact of illegal migrants on the labor market, thus opening jobs for legal residents and allowing wages in some depressed parts of the labor market to rise. b) legal status for those unlawful aliens who meet three criteria: they had been more or less continuously in the country since January 1,1982; they did not have serious criminal records; and they applied for the benefit. IRCA's supporters argued that the combination of employer sanctions and legalization would simultaneously reduce illegal immigration and, one time only, allow otherwise law-abiding, long-term illegal migrants to become legal. America's illegal alien population would then decrease, thus opening additional jobs for resident workers and reducing labor exploitation. The numbers of illegal immigrants would fall as potential undocumented workers ceased coming, fearing that they would not be hired and as settled aliens became legal and less vulnerable to exploitation. The two kinds of arguments against IRCA were global arguments which Congress eventually rejected, and special interest arguments which Congress accepted in part by altering the legislation to meet at least some of them. Among the global arguments were that the nation should not reward illegal behavior with legalization, that employer sanctions would be no more successful than prohibition, or that employer sanctions would make alien workers not eligible for legalization even more exploitable. Congress eventually rejected the global arguments, but the special interests' arguments eventually led to compromises. The leaders of Hispanic organizations and some Asian groups charged that employers fearful of sanctions would discriminate against "foreign-looking people." Since there are millions of such persons in the labor force. Congress was concerned. The other group comprised the growers of fresh fruits and vegetables, primarily in California. It represents some tens of thousands of persons, well-funded, well-organized and very assertive. They claimed that employer sanctions could dry up their supply of foreign farm workers with disastrous results. Admitting they had been dependent on illegal migrants, they wanted a long transition period before facing the rigors of the American labor market. Congress ultimately heeded these arguments. These two quite different pressures led to major alterations in the basic legalization-plus-employer sanctions formula (a trade-off in itself). IRCA was amended to create a new civil right-employers could be sued in a new legal system for discriminating against non-citizens or "foreign-looking workers." made legalization for farm workers easier than for other workers, requiring SAWs to prove only very limited work periods in the States (such as 90 days between May 1985 and May 1986) to be eligible. set the effective date of employer sanctions at December 1, 1988 in agriculture, compared to June 1, 19872 for the rest of the economy. created a more relaxed guest worker program in agriculture than the current H-2 program (the name comes from the enabling clause in the basic Immigration and Nationality Act-INA). H-2, a small and specialized program, has been long used by East Coast growers but rarely by those in the West. It has been regarded as exploitive by the AFL-CIO and some other critics. created a future program for recruiting Replenishment Agricultural Workers (RAWs) starting in 1989, should growers still lack enough labor. to protect the growers of perishable fruits and vegetables from a tight labor market. How well, in its first ten months or so, did IRCA meet its primary and secondary objectives? The short answer is that the impact of IRCA appears to be less dramatic than hoped, and considerably gentler than feared. IRCA seems to be moving, slowly, towards its primary objectives while the feared problems of IRCA-caused employer discrimination and IRCA-caused farm labor shortages are not yet visible. A key assumption underlying IRCA is that ending the availability of jobs in the United States for illegal aliens would remove the most compelling incentive to illegal immigration. Early experience tends to validate this assumption. As actual or prospective illegal migrants perceived that the U.S. labor market had been closed to them, significant percentages of them altered their behavior, refraining from entering the U.S. at all; others apparently left the nation. Some of them again modified, their behavior in response to subsequent contradictory events in the United States that changed those perceptions. The balance of this report covers these subjects: the apparent, perhaps short-term, drop in illegal migration from Mexico in the period after IRCA's signature; the substantial but slower than anticipated use of the legalization program; what little we know about IRCA's labor market impacts; and the minimal use of the special programs created to avoid farm labor shortages and discrimination against "foreign-looking" workers. The report closes with a chapter on some unfinished business in the field of migration control. Reviewing IRCA's effects on illegal entries brings up a major difficulty in many public policy areas, the quality of the information on which decisions must be made. While the number of deaths on the highway caused by drunk drivers is pretty well known, the extent of income tax evasion and use of illicit drugs are not. Similarly there are no hard figures on the numbers of resident illegal migrants (stock), their movements into and out of the country (flows), and their effects on the country. Clearly there are illegal immigrants, however, and public policy must be made on the best estimates available. INS apprehension data offer a current system which, if approached carefully, can produce useful estimates on the early impact of IRCA. The general notion is that some portion, probably a fairly steady portion, of those seeking to enter the country is apprehended by the Border Patrol, and that if apprehensions are down so, too, is the total traffic. The most popular illegal route into the United States is over the U.S.-Mexico border, between the ports of entry. One who arrives in this way "enters without inspection" (EWI) to use the INS jargon. Another large group of illegal migrants arrives through the ports of entry. These are the document-carrying "visa abusers," who either arrive with fraudulent documents or, more likely, violate the terms of their visas after admission by overstaying or by working. Unlike EWls, visa abusers are more likely to be urban, are much less likely to do farm work, are likely to have had more education and more likely to come in family groups.5 Visa abusers tend to stay longer and cross the borders less frequently than EWls. They come from allover the world, too, rather than just from the nations to the south of us. Border Patrol apprehensions, then, relate to a specific if very important type of illegal migrant: those who enter from or through Mexico bearing the EWI characteristics noted above. As shown later, apprehensions (arrests) of such persons fell sharply after the signature of IRCA, suggesting a smaller number of persons tried to enter the country in that manner . The Immigration Service tends to use total Border Patrol apprehensions at the Southern Border in its press statements. Exhibit 1 shows these apprehensions for the first eleven months of IRCA, and the comparable periods in the two previous years. (There are strong seasonal swings in northward movements of illegal migrants-virtually no one crosses on Christmas Day, and many head north in the spring-hence comparisons with the same month of the previous year are important.) Exhibit 1 indicates that apprehensions were down by some 34 percent over the entire period, reaching a low in May, and then coming close to the previous year's experience in the summer of 1987, before falling again in September. 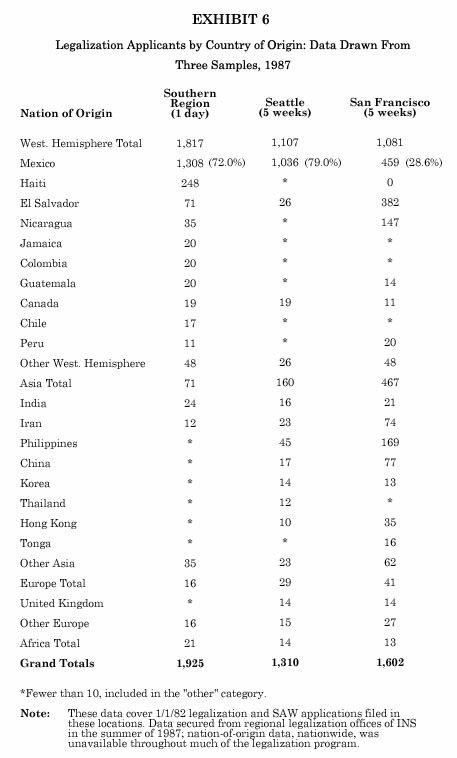 Although total apprehensions are a crude index of total illegal crossings, these data suggest that IRCA discouraged many Mexican Nationals from trying to cross the border . The picture comes into much better focus, however, with a more detailed examination of Border Patrol statistics. The trouble with gross apprehension data is that it does not control for two factors: Border Patrol tactics, which change from time to time; and Border Patrol resources, which have been growing in recent years. If the Border Patrol adopts (or is forced to adopt) strategies that are less productive, then apprehensions will fall. If the Border Patrol secures more resources, primarily more agents, then apprehensions will increase. If both happen at the same time, as occurred in the period under scrutiny, how does one know what happened to the total flow? There is at least a partial answer. To cope with the question of tactics, one can make use of the traditional Border Patrol practice of reporting its apprehensions by the various tactics used in its work. When it inspects freight cars heading towards the interior, it is called "transportation check." When it arrests undocumented agricultural workers at their workplace, it is "farm and ranch check." And when it arrests people in the act of crossing the border, it is "linewatch." IRCA forced a change in Border Patrol operations, one that automatically reduced apprehensions. Its "open fields" provision mentioned earlier all but eliminated farm and ranch check, which had always been the Border Patrol's most cost effective tactic. (In these operations the Border Patrol did not wait for people to cross the international border, as they do in linewatch, they simply went to a field or an orchard where they knew there would be a sizeable number of undocumented workers and rounded them up. To compare apprehensions over time without worrying about the potential complications flowing from these changes in tactics, we have used line- watch apprehensions in most of our calculations. 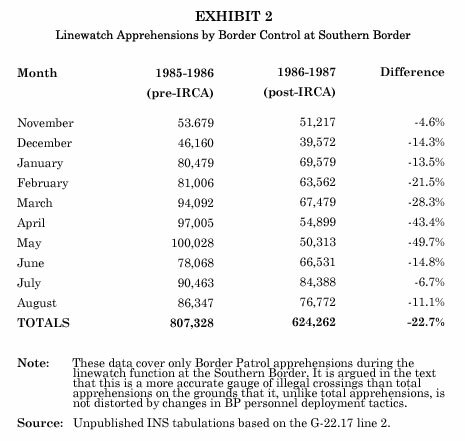 Although over a span of years the Border Patrol's technology has improved,6 its day-to-day work at linewatch varies little over the short term, and thus it is appropriate to compare linewatch apprehensions in June of 1987 to those in June of 1986, for example. Officers on linewatch observe the area near the border, using night vision scopes after dark, and respond to sensors alerting them to northward-bound human and vehicular movements. As Exhibits 2 and 3 show, linewatch apprehensions were nearly 23 percent lower in the ten months following the signature of IRCA than in the comparable period a year earlier. This decline is both less dramatic than that of total apprehensions but we submit a more accurate reflection of the drop in the total illegal flow over the southern border. 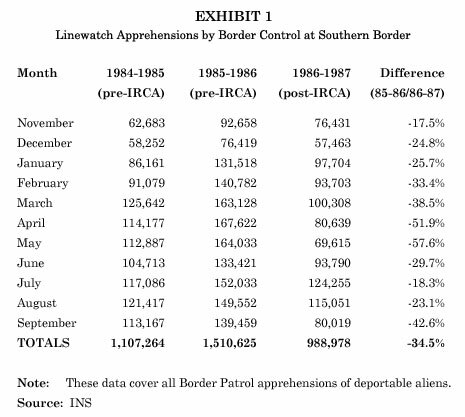 But the raw linewatch data still are not controlled for resources, and there were more Border Patrol agents available for linewatch in 1987 than in comparable periods of 1986. What does that variable do to estimates of the illegal flow northward? To eliminate the statistical confusion caused by the presence of tactics and resources variables we use another element of the Border Patrol record-keeping system, its daily totals of the amount of officer hours devoted to each tactic at each Border Patrol Station.7 It is possible, then, to record how many apprehensions the Border Patrol has made at linewatch, and to calculate the number of linewatch apprehensions made during an average agent's ten-hour day. (Agents typically work overtime.) Although this may seem a fine point to those outside the immigration field, apprehensions-per-agent-shift is a better proxy measure for illegal migration than raw apprehensions, for it controls both for changing INS tactics and for changing INS resources. We have followed various uses of these measures over the years.8 At first we used the concept of officer-hours-per-apprehension. In a report filed with the Select Commission on Immigration and Refugee Policy back in 19809 we noted that the total number of officer hours per arrest (for all INS enforcement activities) had fallen from 12.3 in 1970 to 5.1 in 1980, suggesting a remarkable increase in the number of persons exposed to these enforcement activities, primarily Mexican Nationals crossing as EWIs. The underlying notion here is that if it takes fewer hours to locate a deportable alien, there must be more of them to locate. Exhibit 3 also shows that apprehensions-per-shift fell after IRCA was signed by a somewhat larger margin than the decline of linewatch apprehensions. No matter how measured, however, that impact was diminishing as the months passed. 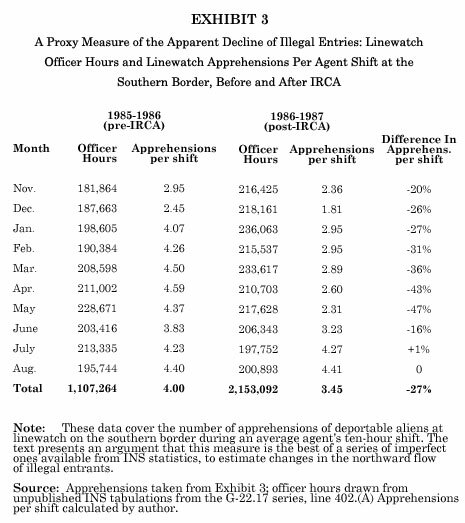 By August, 1987, linewatch apprehensions moved closer to 1986 levels, particularly in the western region, as reports sifted into Mexico about alleged farm labor shortages on the West Coast, a subject to which we will return. Assuming that these apprehension data mean that for some months there were fewer attempts to enter the U.S. illegally, do we have any idea how many people did not seek to enter the U.S. because of IRCA or where they are now? These are difficult questions for at least three reasons. First, INS apprehensions data are events data not people data. They record the number of times someone was arrested, not the number of persons arrested. There are many instances of repeated arrests of the same person. Secondly, we do not know the ratio of attempts to arrests; do two people try to cross for everyone arrested? Or does the Border Patrol catch one out of three who make the attempt? We calculate, at linewatch alone, 183,066 fewer apprehensions in the November-August period of 1986-1987 as opposed to the comparable period a year earlier. Were the attempt-arrest ratio 2-1 then the missing apprehensions would suggest an absence of some 366,000 attempts to enter the country. If the attempt-arrest ratio is 3-1 ("for every one we catch two get away") then the missing apprehensions would suggest the non-occurrence of more than half a million attempted illegal entries. Thirdly, where were the people who did not seek to cross the border? Were they staying in their home country, or were they in Los Angeles and Chicago, afraid to return to the village for the Christmas of 1986, and hence not returning across the border in the months that followed? There is simply no answer to the last question except that there must have been at least some people in each of the two categories. Further, in one sense it does not matter where they stayed for unlawful attempts to cross the border, be they successful or unsuccessful to the individual, are dangerous, expensive and time-consuming for all concerned as well as contrary to both U.S. and Mexican law. If only some 366,000 of these events did not occur, at least partially because of IRCA, that is a good thing. If more than half a million such events were avoided, so much the better. But to what extent was it IRCA that caused the apparent changes in the northward flow of illegal migrants which has been discussed above? It is hard to identify causes when one is speculating about the actions of hundreds of thousands of people unknown to you. But there are four strands of evidence that provide some light on this question. They deal with: 1) what happened immediately after the law was signed; 2) the apparent reaction of smugglers to the new law; 3) what departing illegal aliens had to say about the impact of the new law, and 4) the complicating role played by the Rio Grande River during the period. Ronald Reagan may not have been a major force in the design of IRCA, but he played an important cameo role on November 6, when he signed the bill into law at 10:00 a.m. EST. Many illegal entrants pay smugglers or "coyotes"10 to help them cross the border and get to jobs in the North. The Border Patrol's seizures of smugglers' vehicles over the last several years have provided another useful data base. At the southern border, when the period November 1985- June 1986 is compared to November 1986-June 1987, we find that the number of seized smuggler vehicles dropped from 6,957 to 4, 796, a decrease of more than 2,000 cars, or 31 percent. In short, smugglers, as well as would-be illegal entrants, were less active after IRCA than before it. The Effect of a Swollen Rio Grande The Rio is grand in length, not in depth or width. During much of the year one can wade it in most places. Some people cross the river two ways every day as they commute illegally to jobs in Texas. In El Paso the shallow river and a feeble fence are all that separate downtown Juarez, a city of more than a million, from downtown El Paso. The normally shallow Rio Grande rose to record heights during the winter and the spring of 1986-87. To what extent was it the river, and not IRCA, that discouraged illegal entries? The rise of the river clearly was a factor along the Texas segment of the border. Most Mexican Nationals, the Border Patrol believes, cannot swim. How much of a factor was it? The River separates only Texas from Mexico, and routinely 65 percent of the linewatch apprehensions take place west of El Paso (and thus over dry land).11 Further, the Rio Grande is heavily used for irrigation below El Paso, reducing its volume considerably. Border Patrol officers say that the height of the river affects cross-border traffic only in the El Paso and the Del Rio Sectors. An examination of linewatch apprehensions in the periods November 1985 through June 1986, (i.e. pre-IRCA and pre-high water) as compared to those in November 1986 through June 1987 (post-IRCA and during high water) shows decreases of about 27 percent along the Texas-Mexico border generally, and about 27 percent in the El Paso and Del Rio Sectors. There is always some movement back to Mexico from the U.S., particularly as harvesting slows and as Christmas approaches. Earlier this year, however, there were reports of a number of movements back to Mexico and to Central America that were related to the new law, not to the changing of the seasons. The Catholic Diocese of Brownsville (at the southern tip of Texas) has long aided migrants, both legal and illegal. In the spring it began getting requests for help from undocumented Mexican Nationals heading back to central Mexico because they could not get work in the states or had lost their jobs. The Mexican government either, in response to these movements or in anticipation of them, opened hostels for them in various border cities. Border Patrol intelligence officers suggest, however, that the opening of the hostels (in one case a bleak, abandoned factory) was more for press coverage than for human services. Border Patrol agents in Sierra Blanca, Texas, a small town on the highway some two hundred miles east of El Paso, regularly run checks on traffic going in both directions. They interviewed, but did not apprehend, scores of Central Americans heading home from California because they could not get jobs. "What were they doing in Sierra Blanca?" I asked, "Why didn't they simply drive south from Los Angeles, rather than go that far out of their way?" The response was they they understood that the amount of the "mordida" extracted by Mexican border police was considerably less at check points on the lower Rio Grande than it was at the California border. *Apparently a failure of a smuggling arrangement; there is no explanation of this question in the Border Patrol document from which these data are quoted. At a season when most of the flow of illegal migrants across the border is usually job-bound and northward, 50 percent of these respondents said that the lack of jobs was causing them to leave the country. The farm workers seeking SAW status had their choice (which they may not have known) of applying at a large number of U.S. locations or at three U.S. consular posts inside Mexico. What we have just described about the exodus of illegal migrants are straws in the wind, not solid statistical evidence. The straws seem to be blowing in the same direction, however, suggesting an unusually heavy flow of the undocumented out of the country. This has undoubtedly been a painful process for the individuals involved, but it does suggest that IRCA has created some pressures to reduce the resident illegal migrant population as well as discouraging the arrival of new illegal migrants thus producing some movement towards a primary objective of IRCA: the discouragement of illegal migration. Throughout the debate on the Simpson-Rodino Bill there were spirited arguments about when the cutoff date for legalization should be, and how many applicants a given cutoff date would produce. Generally, the immigrant advocates wanted to set a fairly recent effective date and played down the number of persons who would come forward. Restrictionists, on the other hand, wanted a date firmly in the past, and were worried that many millions of people would apply. The restrictionists and the enforcement people within INS were worried about the extent of fraud. Some supporters of tighter controls had sought to delay any legalization program until it was clear that employer sanctions were working. Congress set a compromise date of January 1,1982. Applicants for the regular legalization program had to be resident in the U.S. on that date, and had to be in illegal status from that date until they applied. (They also had to show nearly continuous residence in the country.) Shorter periods of time when spent in farm work13 qualified one for the SAW program. No one had a very good estimate for how many applicants would come forward. INS, wisely, chose to plan on the basis of a large group of applicants. Some INS documents used 3.9 million as the number of applicants, estimating that some 2.9 million of them would be eligible. Commissioner Alan Nelson, however, before the program began, said that he thought there would be a turnout of about two million. Despite these uncertainties, planning had to proceed. One central question was: how could INS best reach out to a population that was fearful of it? Congress had decided earlier that voluntary agencies that had worked with immigrants (legal and illegal) could help by playing a role in th program, serving as buffers between the aliens and the Service. They were to counsel the applicants and help them fill out the forms, a daunting task. Groups doing this work became "Qualified Designated Entities" or QDEs. The next question was "who will pay for it?" The Office of Management and Budget (OMB) barred the use of tax funds so the program had to be financed totally from application fees. INS had to borrow funds from the Border Patrol and other INS units to launch the legalization program. INS set the application fees at $185 for each adult, $50 for each child with a maximum of $420 for a family. These fees were controversial since they and related document and medical examination outlays could cost an applicant as much as $1,000. Then, there were complex implementation questions. Where would INS place its specialized legalization offices? (It was decided early on that the legalization program, for a variety of reasons, would not use the existing network of INS district offices.) What financial and other arrangements would be worked out with the QDEs? How would the program be publicized? All these matters had to be resolved between the signing of IRCA November 6 and the first day of legalization, May 5, 1987. INS responded to some parts of this substantial challenge rather better than to others. the INS legalization offices have been surprisingly attractive and welcoming to applicants. By October 2, 1987, almost five months into a year-long program, nearly 800,000 people had applied for legalization, some 17 percent of them, nearly 137,000 applicants, under the farm worker (SAW) program. See Exhibit 4. Legalization began very slowly. There were only 683 applications filed each day during the first week, or fewer than seven in each of the 107 legalization offices. Two weeks later the nationwide figure had grown to 2,992 per day. At this rate INS officials became concerned, sure that fee would not be sufficient to repay the internal loans. What can be said about these numbers? First, 800,000 legalizations is a large number, given the seven remaining months of the program, and its complexities and expenses. Total legalizations may not reach the highest of the INS predictions, but they are clearly running well above the low levels predicted by INS critics. Further, the applications in hand, by the end of September, indicate that the U.S. program will be larger by far than the total of all amnesties ever conducted by other nations. Secondly, many of the undocumented, as many of the rest of us, are procrastinators, and they will not file until the last minute. In the 1970s when Canada launched a fairly simple, well-funded, well-publicized legalization program, fully 10 percent of the applicants filed on the last day of the program. Just as fewer applications have been presented than anticipated, there apparently have been fewer fraudulent ones discovered than feared. As this is written INS is turning down only about 4 percent of the mainline applications (but a higher percentage in the SAW program). A word of caution, however. In such programs the best applications are presented first, and INS regional processing offices are, at this writing, still working with the first round of applications. Further, INS may be quietly postponing negative decisions so as not to discourage other applicants as it did in its small-scale Virgin Islands legalization program a few years ago. 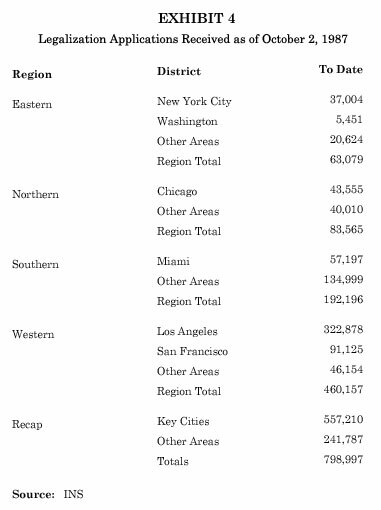 Congress knew IRCA would affect some parts of the country more than others, since illegal aliens are not distributed evenly. This turned out to be even more the case than anticipated. Exhibits 5 and 6 show the heavy concentration of legalization applicants. As of August 21, 1987, (Exhibit 5) more than 54 percent of the regular applicants had filed in California-40 percent in Los Angeles alone; more than three-quarters of the nation's total have filed in three states: California, Texas and Illinois. 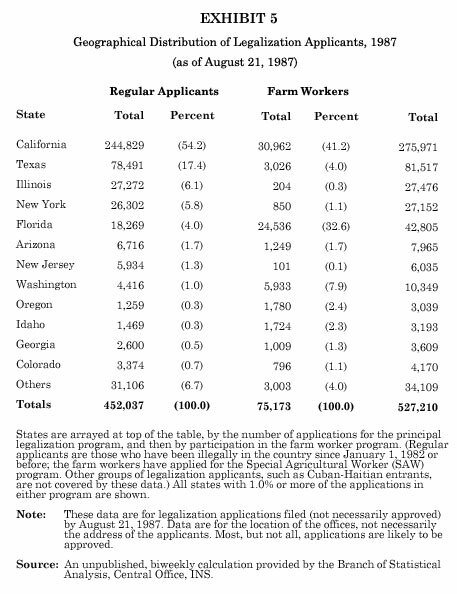 Similarly close to three-quarters of the SAW applicants have filed in California, Florida and Washington State. For a complex set of reasons, some of them internal to INS, some internal to the QDEs, and some growing out of what has become an often scratchy relationship between them, the QDEs have played a smaller role in this program than they, INS and the Congress had anticipated. Less than 20 percent of the applications filed with INS have been processed by the QDEs. INS provided relatively little up-front money to the QDEs, only seventy-five cents for each anticipated application. (Local QDEs receive $15 from INS for each application approved, while the national umbrella organizations, such as the Catholic Refugee and Migration Service, receive an additional dollar. The seventy-five cents per case advance relates to the dollar per application paid to the national QDEs. Most of the QDEs expenses are to be met by non-federal sources, primarily fees charged to the applicants.) National INS publicity material has often not mentioned the role of QDEs in this program, though local INS offices have tended to feature the QDEs role. Some of the QDEs, who had been battling INS in the courts and in Congress for years, viewed the program with suspicion, sometimes over-preparing their cases, to make sure than INS provided a favorable decision. In many Catholic dioceses every case is examined by an attorney before it is submitted, even though INS lawyers review only a handful of cases. Meanwhile the word spread among the immigrant communities that waiting lines were longer at the QDE offices than at INS, that you could file with INS without paying the QDE fee, and that INS was approving an overwhelming majority of cases. One of the real surprises of the legalization program was a visual one. After years of visiting INS offices all over the country I was startled when I walked into the legalization office in Arlington, Texas. It was very different from the traditional INS waiting room. It was big and bright and well marked. The furniture was new. The place was neat, clean and uncrowded. There were signs in Spanish, and much of the staff spoke that language. I subsequently visited half a dozen more, and they all met that description. The positive look of the office is not misleading. Movement through it is relatively swift if not quite at the speed one often encounters in the State Department's Passport Office. Most of the interviews are brief, and everyone who actually files an application concludes a visit on a happy note. The instant photograph is attached to a computer-printed ID card that is then laminated. The applicant is then handed the still warm document. It is a positive conclusion to the visit, an immediate gratification to the alien for making the decision to seek legalization. Employer sanctions, the principal labor market intervention, require that employers must keep adequate records on the immigration status of all persons they hire after November 6, 1987, and that they will be fined (sanctioned) should they be found to have knowingly hired illegal aliens, or to have failed to keep adequate records. The basic document is the I-9 which is to be signed by the employee, and which shows the proof offered by the employee regarding his or her legal status. Some supporting documents, such as the U.S. passport, can be used to show both identity and legal status. If no document that can do both is available, the worker is required to show an identity document (such as a driver's license) and a work authorization document (such as a birth certificate or a social security card). Both wage-hour inspectors from the Department of Labor and INS investigators may check an employer's books to confirm compliance. Employer sanctions were to start slowly. The months prior to June 1, 1987 were for education, with no fines or penalties to be imposed. Between June 1, 1987 and December 1, 1987 employers found in violation were to be issued warnings only for first offenses. Only after December 1, 1987 (for most employers) and December 1, 1988 (for growers) was the law to be in full effect. After those dates an employer found with illegal aliens on his payroll, or inadequate records on his post-November 6, 1987 hires was to be subject to the full penalties of the law. The penalties can range from $100 per person for paperwork offenses to as much as $10,000 per worker for repeated violations. It is not clear how many such firings took place, but there were enough of them, scattered around the country, to secure substantial newspaper coverage, attention which was not regarded as helpful by those administering the law. Just as INS had some trouble preparing adequately for the legalization program, it had difficulties with employer sanctions as well. The necessary forms and instructions and public information materials for this new program simply were not in place by late spring, 1987. Congress recognized this and through an amendment to an appropriations bill postponed the effective date for the citation, or second phase, of employer sanctions enforcement to September 1, 1987. Meanwhile, INS on its own decided to conduct employer visits, to inform employers personally of the law. INS announced that only employers who had been visited would be subject to the citations during the second phase of the enforcement. While INS is in the process of securing additional staff to enforce sanctions, these visits were made by pulling Border Patrol agents and INS investigators off other duties such as linewatch. Whatever the detailed plans are for employer sanctions enforcement, INS is counting on voluntary compliance on the part of employers to do most of the job. Although the newspapers are full of reports of employers taking the new law seriously it is too soon to measure the extent of this compliance. IRCA's effects on non-farm labor markets are indirect and still difficult to assess. It has discouraged a large number of illegal entries, and it has moved more than three-quarters of a million people into a better economic bargaining position by making their status legal, but its direct impacts are harder to measure. Unemployment declined nationally between November 1986 and September 1987, by a margin of6.9 percent to 5.9 percent; the decline in California was from 6.8 percent to 5.8 percent and in Texas from 9.6 percent to 8.5 percent. This probably was coincidental to the arrival of IRCA but a more detailed examination over time, and specific areas of substantial illegal immigrant impact, such as Los Angeles, might be useful. Although there are preliminary indications that employer sanctions will make a difference, at least in some labor markets, we really will not know how much of a difference until the actual enforcement of employer sanctions has been underway for a number of months. If employers are going to examine workers more carefully to avoid sanctions, they might discriminate against "foreign-looking workers" hence the new anti-discrimination provisions in IRCA. If the combination of employer sanctions and legalization causes workers to leave farms, some agricultural employers, previously addicted to illegals, might suffer labor shortages. Congress sought to ameliorate both of these possibilities. What have been the early outcomes in these policy areas? Lawrence J. Siskind has been named special Counsel for Immigration-Related Unfair Employment Practices, a position created by IRCA but left vacant by the White House until IRCA was more than six months old. The post requires Senate confirmation. According to the Acting Special Counsel there had been many inquiries about the operations of Section 102, a six-page segment of IRCA which states "it is an unfair...employment practice...to discriminate against any individual...because of such individual's national origin, or...because of such individual's citizenship status." Eight full-fledged complaints were filed in the nine months after the law was signed, and two of these have been dismissed for lack of jurisdiction. Five other cases were regarded, in September 1987, as incomplete complaints. The six active cases are under investigation. Once employer sanctions are enforced more vigorously, there are likely to be more Section 102 complaints. The law has half a dozen different provisions to ease the growers through a transition to a fully legal work force. The legislative history reveals that IRCA's supporters had hoped that the new law would substantially reduce the number of illegal migrants working on farms, and recognized that this probably would increase wages somewhat. IRCA's opponents in agribusiness disliked the prospect of change in their labor market and rising wages. They spoke vigorously about possible crop losses because of labor shortages, and the notion of moving labor-intensive agriculture to Mexico. An assessment of how IRCA has affected growers, and the extent to which growers have made use of the ameliorative clauses of the bill, require a review of some basics of farm labor. There are at least five sets of factors bearing on the balance between supply and demand for farm workers in a particular crop at a particular time: labor supply, crop patterns, price, organization of work and wages. The first factor is usually stressed by the growers, as is, sometimes, the second and the third; the fourth and the fifth are rarely mentioned. Labor supply. The question of how many workers are potentially available to work the crop really is not the question typically asked by growers. What they usually want to know is more precise: how many workers are available to pick the crop at the wages offered in the employment situation organized as it has been in the past. IRCA might be a factor in this variable, perhaps a very important one, but it could not affect any of the other four, equally important variables in this intricate equation. There are predictable, seasonal variations in the labor supply; school closes and opens again, expanding and then contracting the local labor supply; many migrant families return to their home bases not when the local schools open, but when the ones do back at home in Texas. Weather. Weather can advance or delay a crop, throwing the harvest into a tight or a loose labor market. The early ripening of strawberries in Oregon, before school was over, caused problems on the West Coast in 1987. Price. Not all crops are picked when they are botanically best for picking. Some crops are harvested quickly to take advantage of an increase in price (often caused by a crop failure elsewhere). Others are not harvested at all, if prices are too low. Sometimes a crop can be harvested carefully and profitably for one use (table grapes and fresh market tomatoes) or casually and less profitably for another use (wine grapes cannery tomatoes). Organization of Work. If labor supplies are loose, growers will have less need to organize work tightly, to avoid down time (with piece rates only the worker suffers with down time). There will be less pressure on growers to see to it that there are adequate supplies of picking containers, or that workers who have finished one field are quickly moved to another. Under these circumstances introduction of machinery will not be contemplated. If labor supplies are tight, however, both labor usage and labor relations may be managed more carefully. Wages. Some observers argue that with good organization of work and slight increases in wages most farm labor shortages simply disappear .But growers are often reluctant to change either their usage or their pay practices. In short, the farm labor market is a kaleidoscope, with each of the five elements noted above as movable pieces. As the five variables swirl around in their separate orbits, they combine and reinforce or counterbalance each other. IRCA indeed the foreign farm work force more generally is simply one sub-element within one of the variables, labor supply. The second basic consideration raises a policy question which rarely emerges in discussion of farm labor. To what extent should the farm work force be expanded (by tolerating an illegal work force, for example) to meet growers' needs? Should there be an equal concern about the frequent surpluses of farm labor? Farm workers experience about twice the unemployment of city workers. Often when farm labor shortages are reported in one crop there are surpluses nearby. Keep this in mind in returning to the question of what IRCA has done to the farm labor market. Four points bear examination: (1) What changes, if any, have there been in the composition of the farm work force? Has it become more legal? (2) What has happened to wages? (3) Have there been IRCA-related crop losses? and (4) To what extent have growers made use of the special provisions of IRCA for agricultural employers? Generally we find that so far there has not been as much change as the advocates had hoped, and there has not been as much damage as the opponents predicted. It should be recalled that employer sanctions will not go into effect on farms until December, 1988. Composition of the Farm Work Force. A higher percentage of farm labor is in legal status in the fall of 1987 than it was twelve months earlier, and that percentage is likely to climb in the year to come. While there may be some more active recruitment of legal residents of the U.S. to replace migrants who did not come up from Mexico this year, the principal change has been the anticipated conversion to legal status of the more than 130,000 SAW applicants. Has IRCA Caused Wage Increases or Crop Losses? There have been a few scattered wage increases but it is hard to tie them to IRCA. It is even harder to find crop losses that can be blamed on the new law. Professor Philip L. Martin, of the University of California at Davis (the state's leading agricultural think tank) believes that IRCA will in the long run, increase labor costs in agriculture but senses little immediate impact.21 In a survey he conducted of California's major agricultural employers during the late summer of 1987 Martin found that a majority said that IRCA had affected them largely through paperwork, (presumably they were helping with SAW applications) but only one of the sixty-six respondents blamed any crop loss on the law. The growers also reported 1986-1987 wage increases as minimal "less than the rate of inflation." Earlier this year some growers in Oregon and Washington alleged that IRCA had caused a shortage of farm labor during the strawberry and cherry harvests. Apparently the crops were bumper ones which always cause labor problems and the cherries became ripe a week or two before school ended in the area, another non-IRCA related problem. Simpson warned in his letter that a larger potential problem in terms of both substance and public relations, loomed with the apple and pear crops in September in the Pacific Northwest. He was worried about a shortage of labor. Working at the micro level beloved by the media, National Public Radio's "All Things Considered" program on Labor Day reported on IRCA's effects on some persons in rural California. The interviewer talked with some Mexican Nationals seeking SAW status. While the radio program stressed the impact of IRCA on individuals without discussing the policy behind it, the show did present (perhaps unwittingly) a cameo portrayal of how one Fresno raisin grower coped with what he thought might be an IRCA-caused labor shortage. He (1) helped his long-time workers file for SAW status; (2) raised his piece rate wage from 13 cents a tray to 14 cents and (3), most interestingly, decided to advance his picking season a week, even though he realized that a week later the grapes would be fatter, sweeter and more valuable. But he decided to harvest slimmer grapes rather than risk losing them. What NPR had described were several of the many optional approaches that creative agricultural employers can use to cope with fewer illegal harvest workers. Agricultural labor markets are indeed complex. But too often growers, or at least their spokesmen, talk in overly simple terms. They tell unknowing city folk, in the media and in government, that without their usual crews the crops will rot. They do not say that they do not want to raise the piece rate by a penny. They do not say that they do not want to buy labor-saving machinery, nor do they say that they do not want to cope with the vagaries of the American labor market-a problem faced by all other U. S. employers. They say that if I can not have my way, my crops will rot, and it will be the government's fault. For example, by early September exactly one California grower had sought to make use of the "streamlined" H-2A program which Congress added to the bill to avoid labor shortages. This grower, who had sought five walnut pickers initially, thought better of it and withdrew his order. All other use of H-2A in California at the time consisted of three applications, for one worker each, filed by two dairymen and one chicken farmer. If, in fact, a year before employer sanctions went into effect, IRCA were hurting California agribusiness, one would have expected to see greater use of this program. There have been a few new H-2A applications filed in Arizona and Idaho, but the total numbers are minuscule compared to the fears expressed by the AFL-CIO during the immigration debates. Organized labor feared a massive use of the program, and said it would depress wages and displace resident workers. H-2A is based on the earlier and less permissive form of it, the H-2 program, which has been used for decades by some East Coast growers of sugar cane, apples and tobacco to bring in some 10,000 foreign (generally Jamaican) farm workers a year. The H-2A program does require the grower to deal with the U.S. government, to show legitimate need, and make some promises about wages and working conditions and housing-none of which is needed if one simply hires illegals (or legal resident workers, for that matter). Western growers have resisted this approach and have either gotten along with legal workers, or with what illegal ones they could find (many of them remain), or have coped with anticipated labor shortages in other ways. It may be that 1988 will look much like 1987, some reduction of illegal immigration, and more legalizations of previously illegal workers (the SAW program continues until December 1, 1988). But there will be one major difference employer sanctions will apply to non-farm employers but not to growers, pushing some illegal migrants out of non-farm jobs and into farm work. The 1988 season may be easier for growers than 1987 was. By 1989, the first year in which sanctions will apply to farming, some growers will have been lulled into a false sense of security. They will not have made the necessary arrangements to recruit and hold a legal work force. When sanctions hit them they may rush for the various ameliorative provisions written into IRCA for them, such as the H-2A program, or they may press for greater INS lenience at the border. IRCA is a massive, complex and controversial program for the already burdened INS. But in the course of this study, I was reminded of the need to give careful consideration to four more types of measures if the United States is to deter illegal immigration. These are: (a) working through media in the sending countries; (b) creating individual disincentives for illegal migration; (c) extending the practice of inspecting would-be entrants before they board the plane to the States; and (d) fences. Throughout my travels I kept hearing, from diverse sources, that one of the principal reasons why illegal migration northward (from both Mexico and Central America) declined in the months after IRCA's signature was because of how it had been portrayed in the home country media. Much of Mexico's press has a sensational, competitive approach. There are often several papers published in the same city. Lurid headlines and inaccurate reporting often result. The Mexican press painted the Simpson-Rodino Law in loud colors. There were stories about expected mass deportations and mass firings. Then, hearing rumors of alleged crop losses in Oregon and Washington in the summer, the Mexican press changed emphasis to say that there were jobs in America. The media tendencies that had reinforced IRCA at first, began to weaken it. Dealing with another nation's media, particularly on something as sensitive as illegal immigration, is both difficult and important.25 The United States should make it a matter of high priority. Discouraging a would-be illegal entrant before he comes is far, far better for that person, and for immigration enforcement, then catching him at the border. INS must press the U.S. Information Agency and the Voice of America to spread this message. As important as working with the media is the need to work through the very effective family and community grapevines that transmit news back and forth across the border. INS should try to work out some techniques so that the news of apprehensions of illegal migrants, and fines on employer sanctions violators, get back to the sending areas. A modest suggestion to this end: in FY '86, on 1.7 million occasions illegal immigrants were apprehended and held by INS. Why not provide each arrested person with a free stamped postcard with a return address of the INS detention facility, translated into Spanish. The prisoner would have a chance to write to his spouse or parents. Each postcard, as it is handled through the mail, would remind all who touched it of the enforcement of the U.S. immigration law. Being arrested as one heads illegally over-the border, and then being sent back to the nearest port of entry, is a nuisance, and little more. Being arrested in illegal status in New York, and being sent home to Lima or Sydney is a major disincentive, and the individual either will not try again, or will not try again quickly. Although unpleasant to contemplate the alternatives, INS needs to think creatively about its current expulsion policy. It needs a policy which is, within the bounds of the law, unpredictable-a policy which will create major disincentives to repeated tries at the border and will be feared by potential illegal entrants. The government might use the IRS in this process, to see to it that departing aliens had paid enough to the Treasury to cover their income tax. The principal thrust of the policy would be to increase the cost (and decrease the reward) for working in the United States26 rather than to increase revenues for the United States. The U.S. government might work up the courage to insist that the Mexican government again accept internal repatriation of aliens who are caught in the United States but who come from the interior of Mexico. An INS study of several years ago showed what should have been obvious that an apprehended alien returned to the interior is considerably less likely to be re-apprehended than one sent over the nearest bridge. Finally, if all else fails, why not restore what has been called lateral repatriation. If a healthy male is picked up after crossing the Rio Grande illegally in El Paso, why not send him back across the line at Fabens, a border crossing point a few dozen miles away, and cause him to walk home. Illegal entrants, particularly repeat offenders, are subject to trial and can be jailed. Some are, though not frequently. In the winter some (again with ample notice to the Mexico City press) could be sentenced to jail terms in northern U.S. states. What I am suggesting is that INS take the certainty out of the apprehension business that when you are arrested they throw you back the next day and devise a range of unpredictable, and totally legal, fates for those who are caught, at least for those caught on two or more occasions. Some go to jail, some to Montana in the winter, some are taken to the IRS, and others have to walk 20 to 40 miles to get back to their base of operation. A substantial minority of the illegal migrants to the United States arrive not from Mexico, but from nations outside North America, and do so by plane. It is important that U.S. immigration enforcement not be, and not appear to be, overly focused on the southern border. One border-management device deserving more use is "pre-clearance," the practice of checking the immigration status of U.S.-bound passengers before they board the plane. If their papers are not in order, they are denied admission, but under circumstances far better than at the end of their journey. The would-be visitor who is denied clearance in Toronto returns (unhappy) to his Toronto base, while the would-be visitor denied entry at JFK probably is really furious as he has to stay in a jail-like setting until he can be sent home the next day. Pre-clearance has some costs in that it is more expensive for INS to maintain staff abroad. Pre-clearance is now in operation in Bermuda, the Bahamas, and in several Canadian locations; it was also tried, successfully, at Shannon in Ireland. Pre-clearance has numerous advantages; it lets the traveler move quickly through the airport, because there is no line at the immigration booth; it helps the airline, in that it does not need to pay to house and return the rejected would-be-entrant, as is now the case; and it helps enforcement, in that inspectors are more likely to be rigorous on pre-clearance, on the grounds that they are not as seriously inconveniencing the person they reject as they would were that at a U.S. airport. Further, the ineligible traveler is denied access to the arrays of legal delays and appeals which are available to those on U.S. soil and INS is spared the costs of detention and removal. INS likes pre-clearance. Its spread would indicate, subtly, that the United States is well aware that illegal entrants come from allover the world, not just over the southern border. About five miles east of the Pacific, just before the mountains make travel difficult, there is a flat piece of land along the U.S.-Mexico border. There is a small airport on the U. S. side, Browning Field, and a Mexican highway on the other side. Between them there are a series of posts about two feet high, joined by a cable. The cable is routinely cut, as one can approach it from the other side of the line without entering U. S. territory until one is a few feet from the fence. It is, in short, an indefensible fence. Smugglers' cars routinely seek to enter the United States, carrying people in the passenger seats as well as jammed into the trunk. One such entry took place while I watched, in the afternoon sunshine. The Border Patrol was alerted by its sensors, and I saw the patrol cars chase the smuggler back to the fence, and then along the fence until it found a broken place to pull onto the Mexican highway. By then it had two flat tires, but it escaped, and once onto the highway, the driver got out a dozen feet into his jurisdiction to examine the tires. It was a visual reminder of the nation's unwillingness to take the simplest precautions. Why not, in an area of maximum vulnerability build a fence that would keep autos out, and build it far enough back from the line so that it could not be easily damaged in daylight? The Immigration Service is planning on doing that, at that point, but years too late, and much too diffidently. The structure cannot be called a fence, nor a barrier, for fear of offending the Mexican government. "Border Enhancement" is the term to be used. It might also be useful, over the ten to thirty miles where most of the pedestrian entries take place, to erect fences against such entries. Such fences should not be electrified, should not be lethal in design, just dissuasive, perhaps multi-layer fences. They should be set back far enough from the boundary, and maybe well enough lighted, so that people on the other side will not cut through them. There is no need to do this over the entire border, just in those places of maximum traffic. 1 See, for example: Mark Miller, Employer Sanctions in Europe, Center for Immigration Studies, Paper #3, Washington, 1987; Doris Meissner, Demetrios G. Papademetriou and David North, Legalization of Undocumented Aliens: Lessons from Other Countries; and David North, Alien Legalization and Naturalization: What the United States Can Learn from Down Under, German Marshall Fund, Washington, DC, 1984. 2 Later adjusted to September 1, 1987. 3 I am grateful to Professor Philip Martin, University of California, Davis, for introducing me to this term. 4 It could be estimated more often but only when a major data collection system could be brought into play. 5 David S. North and Marion F. Houstoun, The Characteristics and Role of Illegal Aliens in the U.S. Labor Market: An Exploratory Study, New TransCentury Foundation, Washington, DC, 1976. 6 The two principal components have been an increase in the number of helicopters it now has 19 on the Southern Border and an expanding and increasingly sophisticated collection of alarm systems. 7 While a social scientist might want a different data collection system than the one used by the Border Patrol, it is reassuring to know that the current system is quite consistent for historical comparisons, as it has not changed in many years. It should also be noted that all border patrol agents are classified as officers in the INS data system. 8 In another field in which it is impossible to count a population of interest, whaling, the ratio between the resources used in the whale hunt (number of ships times number of days at sea) and the number of captures is used as a rough measure of the whale population. The greater the resources used on average to secure a whale, the smaller the whale population. 9 David S. North, "Enforcing the Immigration Law: A Review of the Options" in U.S. Immigration Policy and the National Interest, Appendix E to the Staff Report of The Select Commission on Immigration and Refugee Policy, The Select Commission, Washington, DC, 1981, pp. 269-374. 10 In Hong Kong such persons are called "snakeheads." 11 In FY'86, for example, according to the G-22 series, 655,712 of the Southern Border's 1,011,302 line-watch apprehensions took place along the California and Arizona borders. The U.S.-Mexico border is divided into nine sectors by the Border Patrol. Reading from east to west they are, the McAllen, Laredo, Del Rio, Marfa and El Paso sectors, all in the INS Southern Region, and Tucson, Yuma, El Centro and San Diego sectors in the Western Region. The San Diego sector routinely accounts for 30 percent of the apprehensions, and El Paso about 15 percent. The El Paso sector covers both the western end of the Texas-Mexico border as well as the less busy New Mexico-Mexico border. 12 "Many Area Salvadorans Going Home," Washington Post, July 21, 1987, p. 12. 13 Farm workers who were resident in the United States and who had been engaged in seasonal farm work, as defined by the Department of Agriculture, for at least 90 days between May 1, 1985 and May 1, 1986, and who apply, are eligible for the SAW program. Those who did farm labor for at least 90 days in each of the years ending May 1, 1984, 1985 and 1986 qualify for permanent resident alien status more quickly than those who worked in just one year. Virtually all applicants for this program in Florida are Haitians. 14 Nelson's estimate was reported in "Conflicting Figures on Illegal Aliens," New York Times, May 2, 1987, while the 700,000 estimate was in "Hispanic Blasts Alien Amnesty Rules," Houston Post, March 24, 1987. 15 One example: Initially INS ruled that an illegal alien who had been in the country since January 1, 1982, and was otherwise eligible, would not qualify if he or she had been admitted at a port-of-entry on a non-immigrant visa during that period. Later INS decided that isolated legal acts, such as this, would not disrupt continuous illegal presence in the nation for legalization program purposes. 16 For more on this, see the Meissner-North-Papademetriou report cited in footnote 1. 17 These estimates were extracted from an INS document distributed to the QDEs prior to the start of the legalization campaign, in the spring of 1987. 18 The photos and fingerprints purchased by the applicants stay in their file, and are not used in this card-making process. 19 IRCA did not obligate employers to fire such workers, nor did it obligate employers to retain such workers; it simply excepted the employment of such workers from employer sanctions. 20 Unemployment data from the Bureau of Labor Statistics (by phone); for accounts of the clothing industry see "Amnesty Woes Snag L.A. Garment Trade," Los Angeles Times, June 14, 1987 and "Garment Makers Turn to Imported Workers," Washington Post, July 5, 1987. 21 Philip L. Martin, "Negative Impacts of Immigration Reform" in Ag Alert, Vol. 14, No.33, September 2, 1987, Sacramento, California. 22 Letter from Senator to the Commissioner dated July 21, 1987 and released by the Senator's office. 23 This was widely reported; see, for instance, "Surplus of Laborers Bring Bitter Harvest to Northwest," New York Times, September 26, 1987. 24 Raisins retail for 9 to 12 cents per ounce in my Washington area Safeway. Data on the amount of grapes on a tray were provided by Gary Johnston of the Cooperative Extension Service in Stockton, California; he said that the price paid per tray varies from 13 to 15 cents depending on the condition of the vineyard. Growers pay higher unit rates to workers in less productive fields. 25 The situation in Mexico is complicated by the Government's strong control over the electronic media, and its ability to shape, if not control, the print media's treatment of international issues. 26 I gather that IRS once sent some agents to the border for a trial of such a program. IRS decided it could raise more money by using its personnel in other ways and dropped the idea. While many departing aliens would not owe any income tax, many would owe social security taxes. David North is Director of the Center for Labor and Migration Studies of the New TransCentury Foundation, a Washington-based research and operations firm concerned with international movements of people and ideas. Mr. North has conducted a number of research projects for the Immigration and Naturalization Service, and other Department of Justice entities, the Civil Rights Commission and the U.S. Department of Labor. He is an author, with Marion F. Houstoun of the 1976 study, The Characteristics and Role of Illegal Aliens in the U.S. Labor Market. He has served as Assistant to the Secretary of Labor for Farm Labor and Executive Director, White House Inter-Agency Committee on Mexican-American Affairs. Growers' Use of Escape Hatches in IRCA. Many growers, presumably, are taking advantage of the delayed implementation of employer sanctions in agriculture and the new curbs on farm and ranch checks. Some, but not all, have been helping their employees file for SAW status. Very, very few have filed for the newly liberalized guestworker plan, the H-2A program. What the Future Holds. Generally it appears that IRCA had only a minor impact on the farm labor market in 1987. Fewer workers immigrated from Mexico, and some became legalized and may (or may not) leave farm work in the future.